Do you think they chose the right actor to play Voldemort? It's very hard to think of anyone else playing him as we only know that actor. He certainly portrayed Voldemort in a way that was evil, menacing in a smooth, reptilian way and in answer to your question, yes, I think they cast the role very well. Yeah, i think they did. Because growing up with Malfoy Snr would have been horrible. All he wanted was to live up to his fathers expectations. He had moments of such vulnerability... I think there is an alternative universe where Draco grew up in a loving household and is a Hufflepuff, and a bit of a sook. He was a bit of a sook at times anyway. I want that time turner necklace! Just think what you could do with it! Oh yeah. Good point. Wouldn't have been very pleasant living in that household. Where did you read about the alternative universe? I haven't, I am more of a canon kind of girl, but I am sure someone has written one somewhere! Oh yes! An alternative universe one could be a great one to write. Maybe Harry is now an eight foot high dragon, Ron is a hippie who can make it rain with his fingers, and voldemort is a tap dancing goblin. 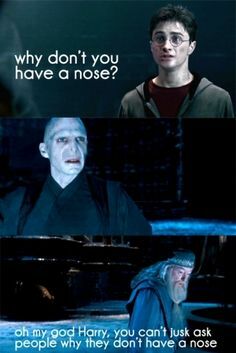 I much rather that voldemort then the real one! Brrrrrrrr sooo evil. He doesn't have a nose? How does he smell? Only 43% potterhead. I thought I would get a BIT higher... Oh well. Yesss. Voldemort was soooo angry. Should have tried meditation or something like that. Yeah.... Or Tai Chi. Maybe. That's ok. You are still a true Harry Potter fan inside your beating heart. Maybe. But maybe he would have tried it for like five seconds but then given up on it because he likes being angry and evil and doing stuff that makes him more calm just irritates him because he would much rather be doing angry evil in the wizarding world.